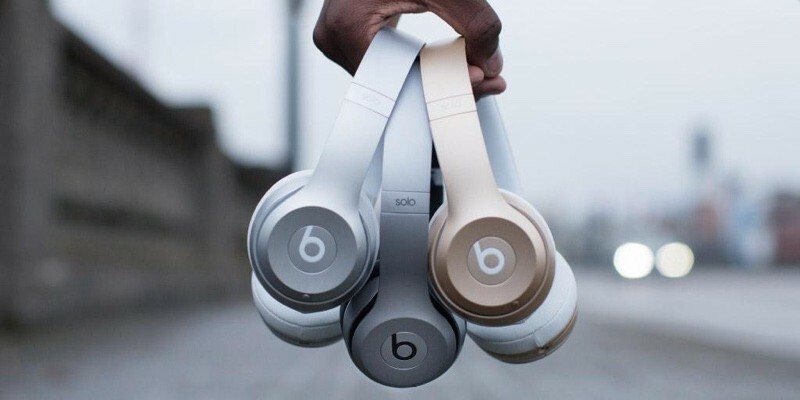 Apple-owned headphone company Beats by Dre today announced the launch of several new Solo2 Wireless headphones, in colors that match Apple's iPhone, iPad, and new MacBook. Available in Gold, Silver, and Space Gray, the headphones are otherwise identical to the company's existing Solo2 Wireless headphones. The Solo2 Wireless on-ear headphones were released in November, and were the first product released by Beats since Apple's acquisition of the company officially closed. The Solo2 Wireless are a wireless version of the wired Solo2 headphones that are a staple in the Beats headphone lineup. Both the Gold and Silver varieties of the new Solo2 Wireless headphones feature white accents and ear cups, while the Space Gray version includes black accents and black ear cups, for an accurate match to Apple's line of Gold, Silver, and Space Gray devices. Solo2 Wireless offers the same dynamic sound and streamlined design as Solo2, but with the added benefit of wireless capabilities. With its Bluetooth technology, Solo2 Wireless can move freely for up to 30 feet from your audio device. Take phone calls, skip songs, and change the volume using the "b" button and volume buttons on the ear cup. Its rechargeable battery allows you to enjoy up to 12 hours of wireless playback. Not charged? Not a problem. Just plug in the provided RemoteTalkTM cable and enjoy your music. Apple has largely taken over the Beats business, with the headphones being sold in Apple Stores rather than on the Beats website and all Beats support being handled by Apple support representatives, both online and in retail locations. Despite this, products being sold today are still those that have been designed without Apple's guidance, and it remains unclear when we might see new headphone lines created with Apple's technology and design influence. The new Solo2 Wireless headphones can be purchased from the online Apple Store for $299.95 and will ship out in one business day. They aren't available in retail stores yet, but should be popping up at Apple Stores over the next few days. Sorry I'll pass. Rather have a Sennheiser or Bower & Wilkins. Since Apple's acquired Beats, has their quality gotten any better? I've never used them, but a common complaint I've heard is that they over do the bass in most situations. NO. They are not hi-fi headphones. They are not designed for actual audio quality. They are a fashion piece. I have a navy/royal pair. They also come in black, white, and red. What color are you looking for? And before everyone chimes in to say how "crap" Beats headphones sound, you need to read some reviews of the newer headphones. They don't sound like crap anymore. They are a perfect mirror of any Apple branded product: they still may be expensive for what you get, but they look great. And now they sound great, too. How does Apple improved their overpriced crappy headphones? They add a few more colors. Yea, that's the ticket. ... And before everyone chimes in to say how "crap" Beats headphones sound, you need to read some reviews of the newer headphones. They don't sound like crap anymore. They are a perfect mirror of any Apple branded product: they still may be expensive for what you get, but they look great. And now they sound great, too. ... Edit: And many 3rd party reviewers are saying the exact same thing.... Solo2 remedied a lot of the deficiencies of the original Solos. Is Apple selling ANYTHING in Apple Stores these days? It's a lifestyle. Nicer air and lighting. It's like going to church, almost. I was a naysayer on Beats headphones due to the first generation being overly bassy and lacking highs. Then the Solo2's came out and they reduced the Bass and increased the clarity on the highs and they are actually fairly decent headphones now. Now would I pay $300 for the wireless ones? Not at all. I got my black and Red ones for $150 on Black Friday and for that, they were a good deal. Edit: And many 3rd party reviewers are saying the exact same thing.... Solo2 remedied a lot of the deficiencies of the original Solos. No lightning or USB-C connector? Agreed. I need something to replace my Firewire headphones. Audio quality is not an opinion. It is measurable and scientific. Heh, nice move... Posting the frequency response of an older model not under discussion nor addressing the question; i.e., regarding the Solo 2.